What is a good way to spend a Sunday? 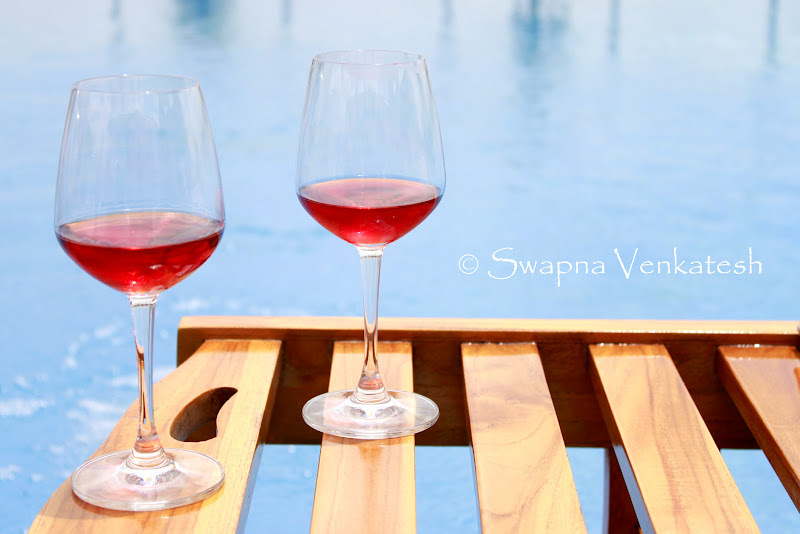 Couple of friends sharing a good meal over some great wine by the poolside on a cheery afternoon – pretty much hits the spot! So that’s what I did, this Sunday. 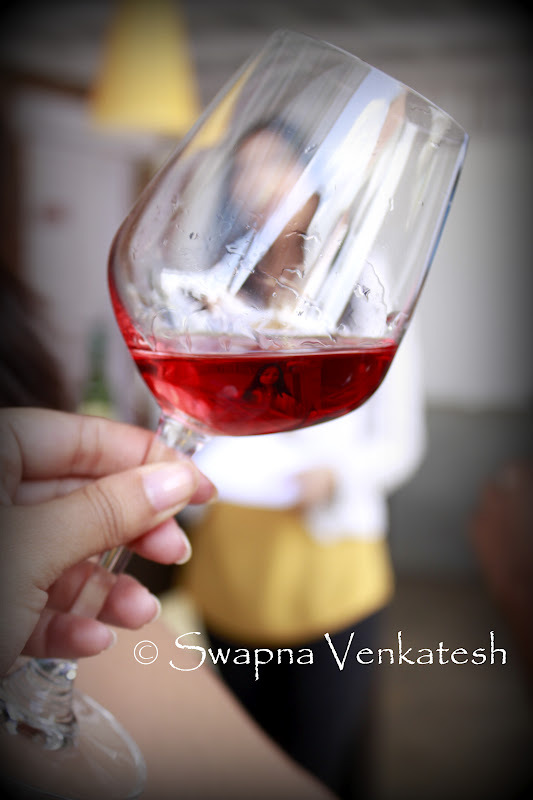 I was invited to a Bloggers Meet at the Royal Orchid which was hosted by Four Seasons Wine. 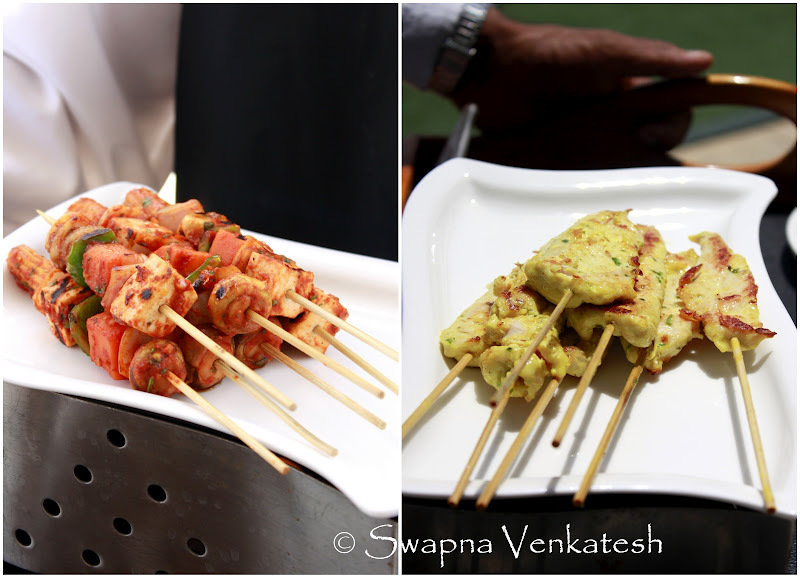 The invite promised a live cooking demo, wine tasting and food pairing and a chance to catch up with fellow bloggers. What’s not to like? The day started off with running into some friendly (boisterous) fellow bloggers and exchanging stories by the beautiful aquamarine pool on the roof top of the hotel. 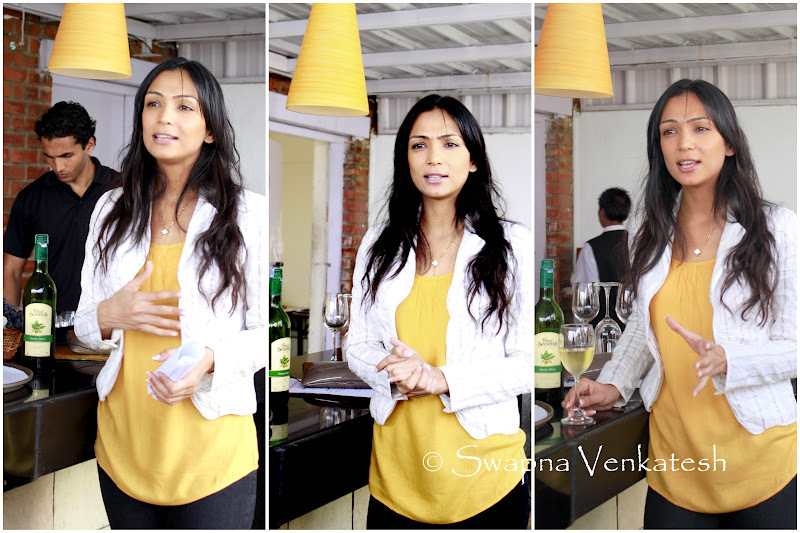 In breezed the ambassador of Four Seasons wine in India – Ex-Miss India Earth Shamita Singha. Not just a pretty face we realized, when she waxed eloquently about the different types of wine. 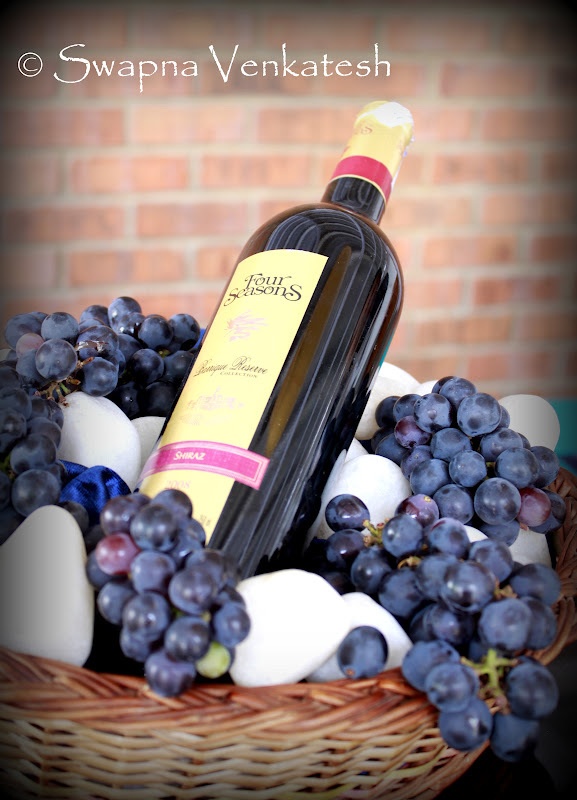 Four Seasons Wines (part of UB Group) is produced at India’s largest winery at Baramati in Pune. They produce a whole variety of wines, but we restricted ourselves to tasting three this afternoon. Shamita guided us through the see, swish, smell and sip technique to fully appreciate a wine, though ending on a cheeky note that it’s more important to have a good time and enjoy your wine than to try and nail the technique. I have to agree whole heartedly! Wine + Friends = Good times! We tried 3 different wines on this occasion. The Blush or Rose (a sweet fruity wine perfect as an aperitif or to serve with savoury starters or even dessert), the Barrique Reserve Shiraz (one of their prize winning wines – a full bodied garnet wine with intense smoky flavors which we paired with main course) and finally a lovely Sauvignon Blanc (a zesty fruity white wine, best paired with a light main course). The white and blush wines are best served at a temperature of 8-10°C and the reds at a temperature of 16-18°C. (We all know that room temperature in India can be a blistering 32°C, so it’s actually a fallacy to use the room temperature ideal for reds in India). Four seasons has quite an informative website if you care to delve deeper into the process, technique and varieties (Click Here). We quickly moved to the live cooking demo by the Chef. The Feta, Apple and lettuce Salad with an orange dressing went beautifully with the Sauvignon Blanc. We had Chicken and vegetable skewers for starters paired with the Blush wine. 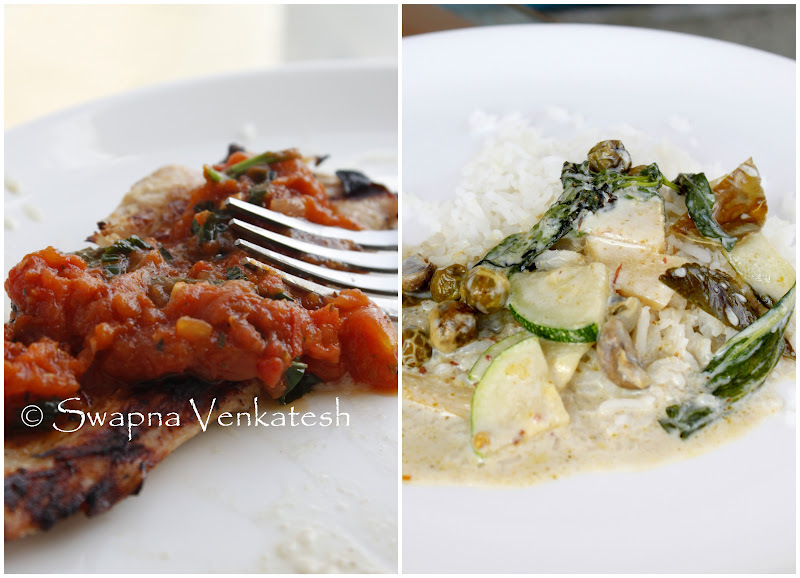 We also learned how to make a Coal Smoked Chicken Breast with a Pomodoro Basilica Sauce and finally a Thai Green Curry. (Though I was vastly disappointed that he used a readymade curry paste from a tub!). But apparently if it tastes good you don’t question the origins 😛 The bloggers were roped in to be his sous chefs and everyone had a good time indulging in some good natured ribbing and cheering! 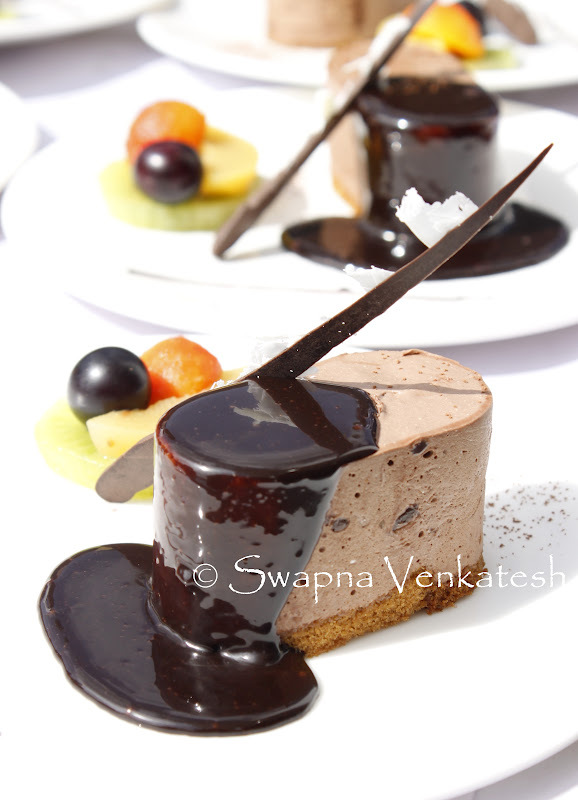 Oh, and we din’t actually make dessert, but we were served a Hazelnut and Chocolate Mousse. I think that was supposed to be paired with the Sauvignon Blanc but after so many glasses of wine we were all engulfed in a happy haze. So on that note we bid adieu to each other and promised to catch up soon. Thanks to Four Seasons for a very well organized event. What I appreciated about it, is the education and dispelling of myths that wine drinking is only for the hoity toity and is such a refined art that it puts itself out of reach of the common man. The mantra is to experiment with and enjoy your wine … afterall, as Benjamin Franklin said “Wine is constant proof that God loves us and loves to see us happy”! Nice work it would have better if you would have elaborated the wine tasting process in detail for the fellow readers…..keep up your good work. yes, four seasons is organizing amazing events….. got invited to the delhi events and i simply loved being part of them!! Really a nice blog. Happy because its related to wine and we are wine enthusiast. regards be in touch.